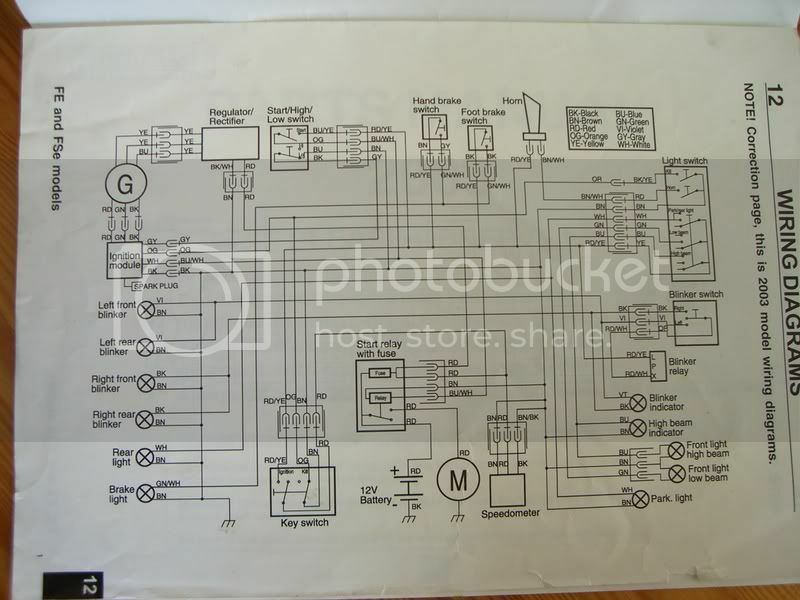 i have checked the electrics in the owners manual and i can see that the 3 yellow cables sholud be connected to the 2 yellow and 1 blue from the stator but i cant see wich one that shold be connected to the blue one. alla 3 yellow cables look the same. i bought the bike like this, it worked when i tried it but then i got this problem. the former owner has replaced the regulator so im thinking maybe he has connected it wrong. i hade this problem one time before. i replaced the stator and battery (new) and the bike ran great for 60km, now i have the same problem again and the battery is ded. i canÃ‚Â´t reaload it. I'll tell you again my old mucker what you have there is a three phase regulator rectifier there and will not work with the SEM stator, not now not ever, you require two separate units a regulator for the lights and a regulator rectifer for the battery (single phase) comprende. and if you look in the spareparts catalog it is only one unit, just like this one. not 2. You are not annoying, your 2003 regulator/rectifier is connected to the 2 yellow and 1 blue stator lead wires exactly the same as my 2000 FE501E is. Mine has a three wire plug on the stator and a 3 wire socket on the rectifier/regulator that control orientation of the leads when connected. 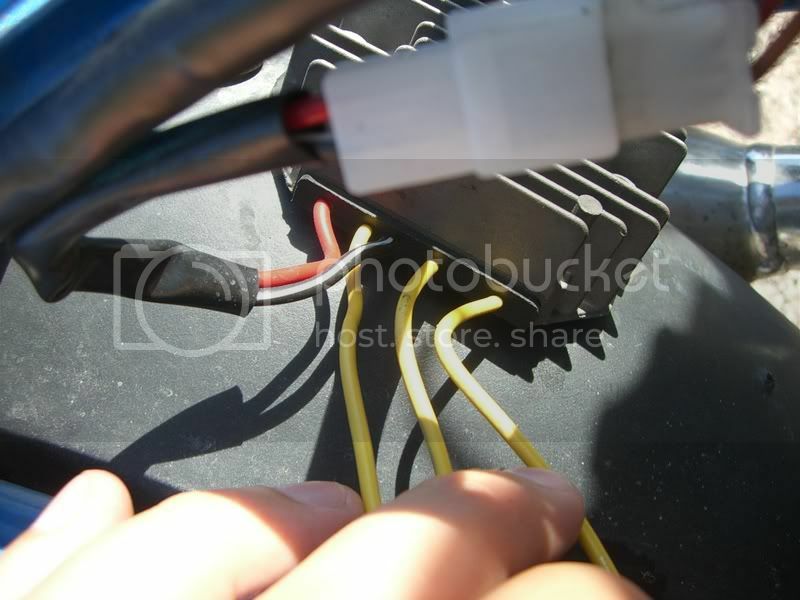 In order to change this OEM orientation, you would have to remove the leads from the plug or socket connector shell and then reinstall them in a different orientation. Does your bike have these same connector shells that control the orientation? Neither the yellow or blue stator leads are internally grounded in the stator. Make sure the black/white lead coming from the regulator/rectifier is grounded to the bike chassis and that the negative pole of the battery is also properly grounded to the bike chassis. If I remember correctly, the stator is connected as a 2 phase 'Y' system with the blue lead being the common lead coming from the point where the phases of the 2 yellow leads are connected together in the stator. All of the AC generated by these 2 stator windings is converted to DC in this type of regulator/rectifier. joe, if it is possible, can you check on your bike wich yellow wire from the regulator that is connected to the blue from the stator? I'll do that on Friday, (tomarrow) and include a picture. I doubt you could have damaged the 12V windings in the stator, no matter how it was connected. They are designed to be connected into a dead short with the engine running - that is how the regulators work. I guess connecting the battery directly across the stator windings would give 'em hell but! For my two bob, the regulator/rectifier unit looks to me like its rectifier is intended for a three phase charging system exactly as Sparks said. However, I can't see any reason why this should not work OK on the in-phase dual outputs from the SEM stator. I guess Mr Husaberg must have believed it would be OK too. It might help to confirm that NONE of the 12V wires from the stator to the reg/rect are grounded. That would screw up the function of the rectifier. The systems that have the blue stator wire grounded run most or all of the electic system (such as the lights) off AC. Any DC items running off a stator with a grounded wire end up with half of the stator output blocked by the rectifier, reducing the DC power available. Erik, here is a picture of mine, I know its dirty but I ride desert and only wash it when I have to do serious work on it. The yellow lead in the middle with the clip on it is the one that connects to the blue stator wire. You said the previous owner rewired the bike. If so, make sure the connections between the stator leads and the Rectifier/regulator are capable of 11 amps. This system puts out 140 watts! You have some sort of short cicuit taking place within in the Regulator rectifier. i got a brand new regulator from a friend today so i will replace it later today and see if that helps. Just another thought if you want to use an after market regulator rectifier say like the one from Trail Tech then what you need to do to get full AC power from the SEM is to join the two yellows together and feed it as one cable along with the Blue, this is putting both windings in pararell. ducati 748 rectifier blue and white wire?